Let me be upfront at the start of this review: Christopher Nolan is my favorite filmmaker working right now. So, I’m always looking forward to whatever he’s got lined up. He’s a director at the top of his game, producing smart, visually stunning blockbusters. His last film, The Dark Knight Rises, made some missteps as he wrapped up his Dark Knight Trilogy, but he has mostly bounced back with his latest film, Interstellar. 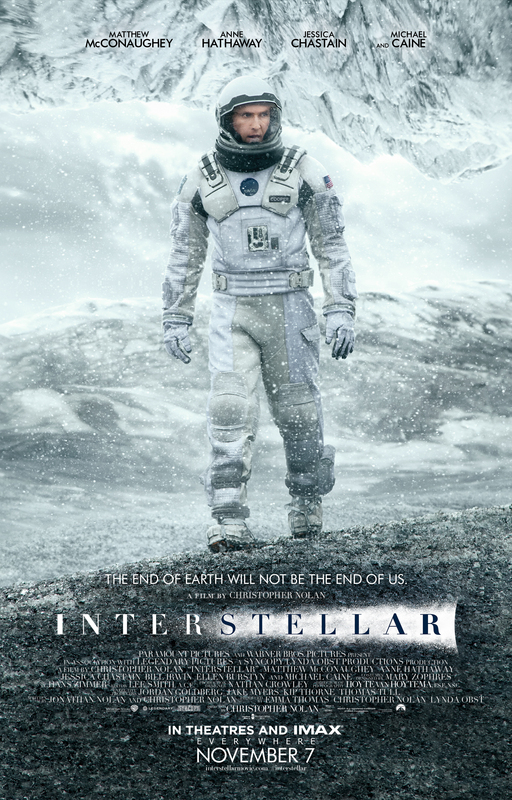 Set a few generations in the future, Interstellar tells the story of mankind on the ropes. Earth is becoming uninhabitable and those who have survived this long are destined to starve to death thanks to a blight that is wiping out different crops like crossing them off a list. Enter Cooper (Matthew McConaughey), a former test pilot and engineer-turned farmer. A widower, he has taken to farming as a necessity in order to take care of his family, which includes his son Tom (Timothée Chalamet) and favored daughter Murphy (Mackenzie Foy). Cooper has always longed to explore the stars, but with the world the way it is, those types of endeavors have been folded up. Or have they? He stumbles onto an operation that is looking to head into space to find a new home. Led by Professor Brand (Michael Caine), the group has discovered a wormhole in space that leads to another galaxy. Explorers have already gone ahead and now a new crew is following up. Brand wants Cooper to be his pilot, but Coop is reluctant to leave his family behind, especially Murph. Ultimately, though, he chooses to put humanity’s needs ahead of his own and he heads to the stars with Brand’s daughter, Amelia (Anne Hathaway) and scientists Doyle (Wes Bentley) and Romilly (David Gyasi). What results is a gripping adventure that spans galaxies and time. 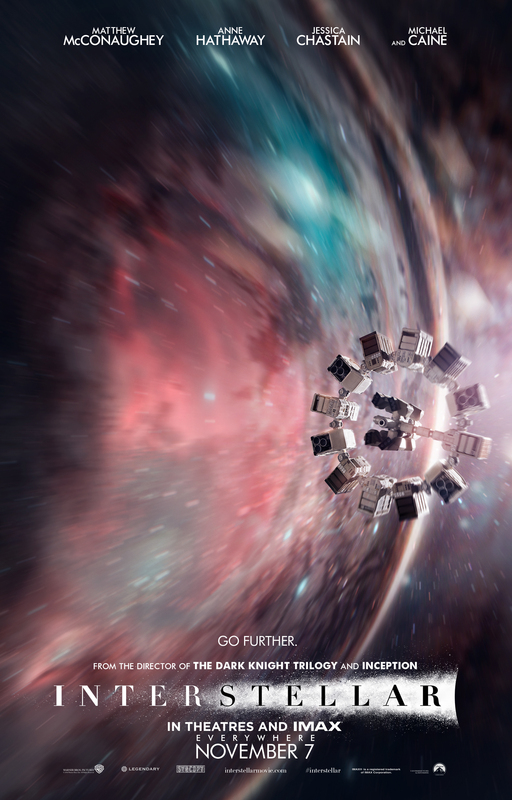 Interstellar is epic filmmaking at its finest. The visuals are breathtaking and really need to be experienced fully in IMAX if you can. Also, this is one of the most emotional films Nolan has ever crafted, as the main through line is the connection and relationship between Cooper and Murph (played as an adult by Jessica Chastain). There is also a lot of science in this film that needs to be relayed to the audience effectively. Unfortunately, the best way to do this is through expository dialogue, but I didn’t really have a problem with that. To me, that came across quite naturally. Sure, there are some clunky bumps in the road, but for the most part, it works. The science cheats in places to fit the narrative, but much of it is sound based on what we know of the universe now. Theoretical physicist Kip Thorne served as a consultant on the film. For me, the biggest stumbling blocks for the film were the seemingly easy coincidences that help forward the plot. Nolan had this problem on The Dark Knight Rises, and I think it stems from the fact that the films are so long—TDKR clocked in at 165 minutes, while Interstellar is 169—Nolan wants to cut to the chase for fear that the films will be even longer. However, this creates problems in the narrative. One of these coincidences is that Coop comes along just as Brand’s group needs a pilot. Then, his decision to leave Earth seems to come a little too quickly. Also, later in the film, adult Murph solves a key puzzle that could have used a few more beats to make it a little more believable. Again, minor quibbles in the overall scheme of things, but they do rankle a bit. I also felt that while the connection between Coop and Murph is strong, there could have been a stronger personal connection between the crewmembers on the starship Endurance. The mission is deadly serious and no one ever really forgets that. I would have liked a couple of lighthearted scenes between the crew to show how they felt about each other and the mission. Traveling across the cosmos might inspire a little giddiness, I would think. That isn’t to say there isn’t humor in this film, though. There are several good lines thrown in throughout in the script by Nolan and his brother, Jonathan. Some of the best material is delivered by the robots TARS (Bill Irwin) and CASE (Josh Stewart). Their design is unique and they are very cool, evoking the monolith from Stanley Kubrick’s 2001: A Space Odyssey. The film’s third act also pays homage to 2001, as well as Contact, and seems to come completely out of left field, but on a second viewing, all the pieces are laid out for the audience throughout the film and I actually enjoyed the film more on the repeat viewing. Though the sound mix is a little on the loud side, Hans Zimmer’s organ-heavy score is haunting. There’s also a lot of great editing in this film with only a few rough spots. Though the story gets a little bogged down in the science, there are some very good twists throughout. What results is an epic, solid film that is probably suffering from astronomical expectations. The entire cast does a phenomenal job, with McConaughey leading the way. He grounds the film with a steady hand. The rest of the cast is just as great with the standouts being Hathaway, Chastain, Foy, and Gyasi. Caine is great as always in his role as Nolan’s good luck charm—he has appeared in six of his films since Batman Begins. Also, John Lithgow puts in a good performance as Murph’s maternal grandfather as does Casey Affleck as the adult Tom. Overall, Interstellar is a must-see film. It’s not perfect by any means, but it is definitely a journey worth taking. The only thing Nolan can really be accused of is having too big a reach as he tests the constraints of a single film. This is a film that could have easily been an HBO miniseries and perhaps should have been. It’s one of the better movies this year and definitely the most ambitious. Go see it as soon as possible. Highly recommended. This entry was posted in Movies, Reviews and tagged Anne Hathaway, Christopher Nolan, Film Reviews, Films, Hans Zimmer, Hodgepodge, Interstellar, Jessica Chastain, Jonathan Nolan, Kip Thorne, Matthew McConaughey, Michael Caine, Movie Reviews, Movies, Podcast, The Dark Knight. Bookmark the permalink.